London Bus Services Ltd (LBSL) has released its latest tender results, with a number of changes on routes across London. Metroline has retained its 43, 82, 90, 113/N113, 134, 214, E6 and W7 routes. The 82, 113/N113, 134 and W7 services will run 25, 18, 30 and 16 new double deck buses respectively. The 90, 214 and E6 services will be run with 15, 18 and 12 existing single deck buses respectively. The 43 service will utilise 33 new and existing double deck buses. London United has retained three routes, the 81, 222 and E11. The 81 will be operated with 14 new and existing double deck buses, the 222 with 19 new double deck buses and the E11 with five existing single decks. 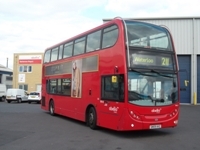 Abellio London was pleased to announce the retention of its 211 route for a further five year term from June 30, 2012. The route will operate from Abellio London’s Battersea depot and use a total of 21 new ADL Enviro 400 double deck buses. The buses will be mixture of both diesel and hybrid. The 211 operates between Hammersmith and Waterloo via Fulham, Chelsea, Sloane Square, Victoria and Westminster and Waterloo. Abellio London’s 490 service has also been retained, and will use 14 new single deck buses, while First London West’s 607 service will also be retained by the firm and will be run with 20 existing double deckers. Contract commencement begins on February 4 for routes 43 and 134, on March 31 for the 82 and 113/N113 routes, on April 7 for Route 607, on May 26 for routes E6 and E11, on July 28 for route 81, on August 18 for routes 214 and W7, on August 25 for route 490, on September 1 for route 90 and finally September 15 for route 222. All of the awards are for operation by conventional diesel engined vehicles, except for 20 Metroline double decks which will use hybrid technology.